The following is a small sample of the horses we have sold over the years. We place great importance on a proper match that will bring joy to both owner and horse for years to come. The horses we have imported and bred have gone on to be foundation breeding horses, performance horses, pleasure trail horses, and treasured companions to their new owners. Placement is always more important to us than profit. Táta’s pure natural tolt and generous character made her a favorite at Sand Meadow. It seemed like there was nothing this pretty mare could not do – and do well! Simply a joy in every way. Congratulations a great owner in NC! You’ve added yet another special horse to your herd. Von is one of those very special horses that just seems to have it all - a cute and perky expression, four clear easy gaits, and an outstanding personality. Add on top of that years of trail experience and you have the ultimate pleasure horse. Von is a great riding horse and a real confidence builder with a terrific work ethic. There is just nothing this little mare can’t do. Congratulations to Susan Johnson of Germansville, PA! She picked a very special horse for her first Icelandic. 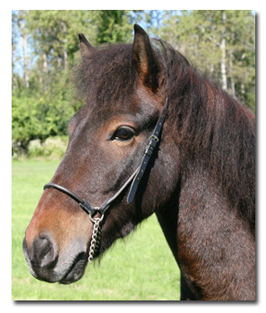 Magni is a four gaited Kalman frá Lækjamóti son (out of the wonderful Sædís frá Melabergi) that oozes charisma and personality. His new owner was searching for a young horse with an unflappable personality and big gaits - and found exactly that in Magni. Not many four year old horses just started under saddle would be so rock solid being ridden out by a stranger next to a major highway. But for Magni it was no problem at all. Congratulations to Amanda Halpern of Walnut Creek, CA! We know you and Magni will be a great team. Sokkadís is a very special filly - the product of two highly evaluated first prize horses, our own Gima frá Ytra-DalsgerðI and the fantastic tolter, Stígandi frá Leysingjastöðum II. Sokkadís was one of the top evaluated young horses in 2013 and is extremely promising for pleasure, show, and breeding. Her beautiful pinto color is just the icing on the cake. Congratulations to Karin Daum of Portland, OR! We look forward to updates on this great filly’s continued development. 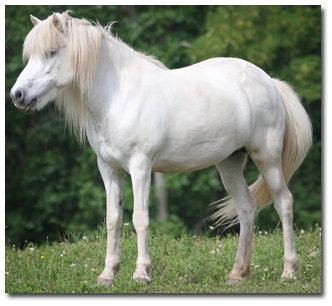 Drífa (aka “The Princess Pony”) is a stunning snow white mare. A pure natural tolter, Drífa has lots of experience out on the trail and is “been-there-done-that” solid and sane. Just the sort of horse her new owner, Laurie McGowan of Hershey, PA was looking for in her very first horse. Congratulations to Laurie! 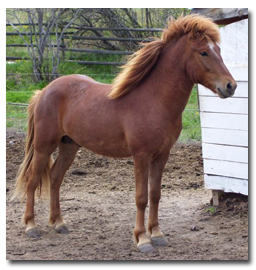 Álfadís is a delightful, sweet, and fun chestnut filly with lots of dancing natural tolt. The daughter of our first prize mare Sædís frá Melabergi and the terrific Hrókur frá Hlemmiskeiði 1A , Álfadís has the genetics behind her to become a superb pleasure horse and possibly a show and breeding mare as well. Congratulations once again to Nancy Green of South Hill, VA! Nancy is one of our favorite clients and we are happy that young Álfadís will enjoy the company of four other horses Nancy has purchased from us. 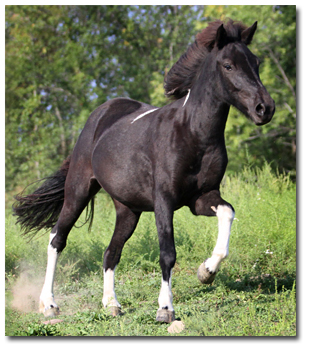 Fenja is a fun, forward five gaited mare with personality plus. So, she needed an owner just as spunky and full of life as she – and Fenja found her match in Deb Callaway of Naples, NY! Deb has been and admirer of the breed for some time and was looking for just the right trail partner to zip around the many area trails. We’re sure these two will have lots of fun together for many years to come. Congratulations Deb! Freyja was the first foal to be born on our Mendon, NY farm. We are extremely proud of how this cute Kalman daughter grew up to be such a beautiful and elegant mare. With an excellent calm and steady character, great work ethic, and 4 clear gaits, Freyja is the total package. Congratulations to Doug and Alisha Schwarz of Glastonbury, CT on their purchase of this stunning mare! Kvistur was made to be a great trail horse. 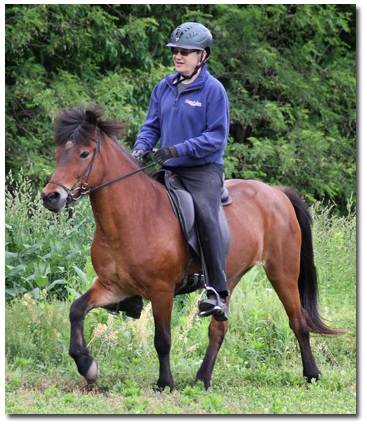 Dependable from the start, Kvistur is a rock on the trails and enjoys working hard for his rider. He is also keen on ponying younger horses and showing them the ropes. He is already so solid that we can only imagine what a superstar he will be as he continues to mature. Congratulations to Nancy Green of South Hill, VA for adding Kvistur to her growing herd of Icelandics! 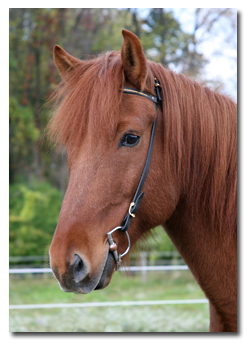 Sailor is an absolutely adorable chestnut gelding with a star and a bright flaxen mane and tail. He is trained to both ride and drive and is a super smooth ride. Though small in stature Sailor is the type of horse that really grows with a rider on board and gives a very proud appearance. He has had a lot of experience with all levels of riders, including small children and timid adults, and is an excellent confidence builder. 100% safe and unflappable, Sailor still has plenty of pep and loves to head out on the trails. Congratulations to Kerri Sher of Bloomfield, NY. Happy trails to you both! The largest Icelandic horse in the world, Múfasa also has a giant heart to match. Rarely have we come across such a sweet and polite horse as he. He gave everything his all and was a super fun ride out on the trail. He was a pleasure to have in the stable and is already missed. 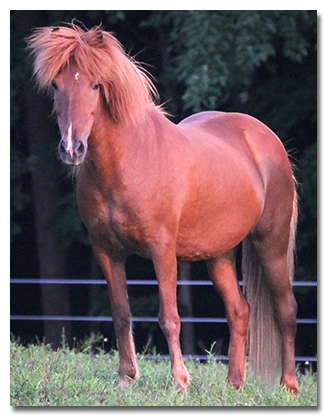 Congratulations to a wonderful owner in NC for her purchase of this very special horse! It’s always nice when two of our horses can go to one great home. A five gaited school master and pace Queen, Kitla brings joy to all that ride her with her exceptional work ethic and good humor. 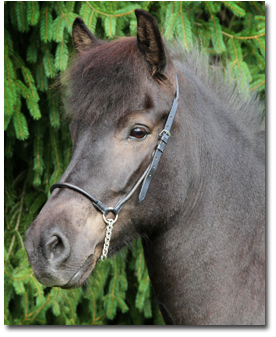 Aska, an extremely promising black filly out of Gima frá Ytra-Dalsgerði by Kalman frá Lækjamóti – two exceptional first prize horses – hopes to follow in her “hoofsteps”. Congratulations to Nancy Green of South Hill, VA on her purchase of both these lovely girls! Dagný is a stunningly beautiful silver dapple mare that is trained to both ride and drive. As bombproof as they come, she is a fantastic trail horse. Congratulations to Annie Shields and Pat York of Rome, Georgia on their purchase of Dagný! As Annie has been involved with Icelandics for over 50 years we know Dagný will be in excellent hands in a wonderful home. Sóla is an extremely beautiful young mare the daughter of our stallion, Kalman frá Lækjamóti out of the 1st prize mare Hera frá Hofi. Even at a young age Sóla turned heads for her elegant and correct conformation. Not only is she pretty on the outside, but she has an amazing friendly and bold character. Her large gaits also do not disappoint. This talented young mare clearly has exciting achievements ahead of her as a performance horse and breeding mare. Congratulations to Christopher and Nathaly Jones of Tuskast Icelandic Horse Farm located in Abbotsford, British Columbia, Canada! Roðadís was the first foal born at Sand Meadow Farm and we could not be more proud of her. She was conceived in Iceland, imported in utero, and born at Sand Meadow farm in 2001. A daughter of the 1st prize powerhouse Garpur frá Auðsholtshjáleigu (1st prize for offspring) out of the 1st prize mare Hera frá Hofi. Roðadís has it in her genes to be a great mare and she did not disappoint. At a young age she achieved a 1st prize score for conformation and a solid 2nd prize overall. She was also successful in the show ring. On the trail she is all fire and energy - the ultimate ride for the experienced rider. The sky is really the limit for this ultra talented mare. 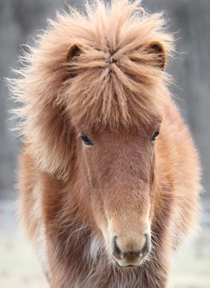 Congratulations to Lisi Ohm of Vindsdalur Icelandic Horse Farm on her purchase of Roðadís. We feel this combination is a dynamic team that has great things ahead of them and we can’t wait to hear of their accomplishments. Perla came to us late in life, but we were very lucky to have enjoyed her company. Confident and wise, Perla was a joy to have around. A strongly five gaited mare Perla had the stamina and energy to take you on the trails all day, up the mountain and back. Perla is the very first Icelandic horse for her new owner Juli Cole of Meant to be Farm in New Castle, PA.
Blær is a charming chestnut with a star colt born in 2008. His dam is Birna frá Akureyri and his sire the wonderful first prize Stígandi frá Leysingjastödum II. Already at a young age he showed remarkable charisma, a bold and easy character, and good movements. He continues to develop into a strong young stallion with a sweet character. 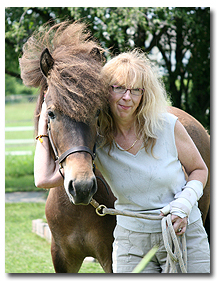 Congratulations to Lisi Ohm of Vindsdalur Icelandic Horse Farm! We hope Blær will be a fine addition to her farm and breeding program. Skáti is a beautiful dark bay naturally tolting colt born in 2007. His sire his our own Kalman frá Lækjamóti and his dam, Fluga frá Blönduósi. He is a cheerful guy that has a very bright future as a exceptional trail horse like both his parents. 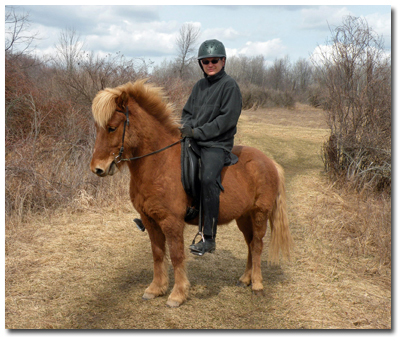 Congratulations to Sandy Plumb of Pittsford, NY on her purchase of Skáti - her very first Icelandic horse! Fluga was a very difficult one to let go. A beautiful and sweet naturally tolting mare she was easy and open to all riders. Fluga’s kind and gentle nature made her a favorite around the farm. She also gave us two beautiful foals, Freyja from Sand Meadow and Skáti from Sand Meadow. Freyja, in fact, is being retained by us to serve in her mother’s place - so she has some pretty big shoes to fill. We will miss Fluga terribly, but we feel she will be happy and well cared for in her new home - Azur Farm in Beaver, PA.
Hrímnir came to us in his late teens. Once a beloved family horse, his children had grown and he found himself without a real job, bored and lonely. 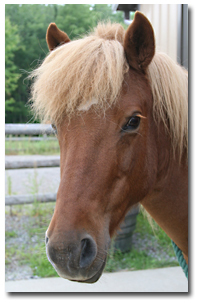 He needed to find his calling in life and we found it for him as a therapeutic riding horse. 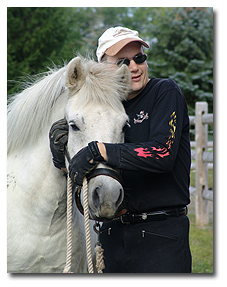 As a pure tolter with a bold personality and real love for people and attention, Hrímnir became a natural at his new home, Atlantic Riding Center for the Handicapped located in Egg Harbor, NJ. At ARCH Hrímnir will spend the rest of his life bringing lots of joy to people who need his gifts the most. 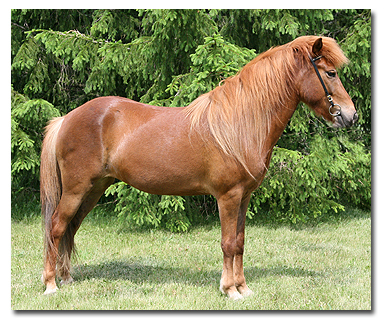 Hera is a first prize chestnut mare imported by Sand Meadow Farm. This daughter of the honorary prize stallion Hervar 963 frá Sauðárkróki is one of the highest evaluated mares in North America for ridability. She is as beautiful as she is talented. For several years she served as a performance and breeding horse for Sand Meadow Farm, giving birth to two very promising fillies for us, Roðadís from Sand Meadow and Sóla from Sand Meadow. 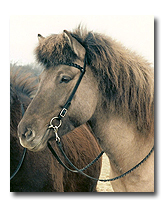 Hera was sold to established breeders of Icelandic horses in California. 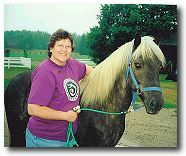 Gumi is a beautiful silver dapple gelding. 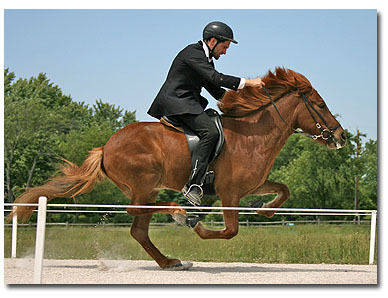 Five gaited, Gumi has taught many the thrill of the flying pace – but his tolt is still always smooth and clear. 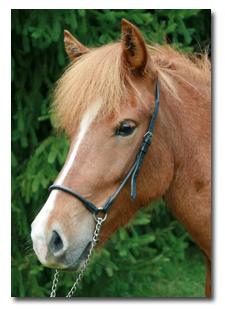 He is safe, reliable, and fun for beginners and more advanced riders. With his intelligence and mischievous character we really miss having Gumi around. He is now happily living in Michigan and much loved by his new “mom” Sue Staggemeier. 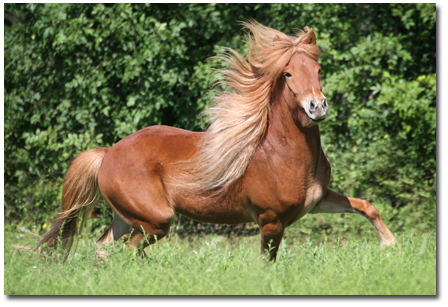 This beautiful and kind blue dun daughter of honor prize stallion Stígur frá Kjartansstöðum was sold to a breeder/trainer of Icelandic horses in Canada. Although Amma was rescued, not sold, we decided to include her. 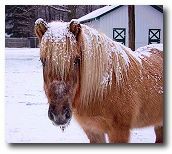 On Christmas Eve 2001 we rescued Amma, an approximately 20 year old red dun flaxen Icelandic mare from a sleazy back yard barn here on Long Island. 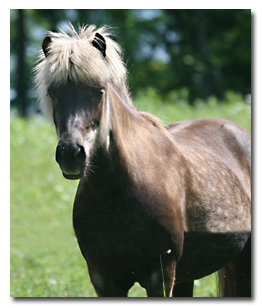 Amma was born on Long Island and a descendant of imported horses known as the "Long Island Herd". Like the herd she came from Amma had quite a rough life. We felt that she deserved a better life and brought her home. Her original name, Taffy, just was not a proper Icelandic name. So, we renamed her Amma, which means "grandmother" which seemed to suit her generous nature and aged appearance. She may not have been treated well in the past, but that didn’t dampen her sprits any. Always full off good cheer Amma was a pleasure to be around. In January of 2002 we found Amma a great home in Pennsylvania with Lynne Alfonsi. Finally she had a home that loved and appreciated her the way she should have been all these years. Sadly, in January of 2003 Amma passed away from a sudden illness despite valiant attempts to save her. It was just her time. Amma’s "mom" Lynne was at her side and comforted her in her last moments. She was a special girl and will be missed greatly by all that knew her.